As a human resources executive, you know your workforce’s competitive advantage must be maintained regularly through training. The problem? Training often isn’t as effective as you’d like. You hear feedback from employees that it is a waste of time or you don’t see improved results or ROI from the investment in training. If this is how you think, you probably aren’t thinking about workplace gamification correctly. Now, imagine a workplace where your employees love to take training. A reality where staff do not just take training because they think their boss will want them to. Imagine training that people actually use in their day-to-day activities. Unrealistic? Not really. If you design while keeping the employees inner motivations in mind, you can create and maintain short and long engagement with your programs. Designing for these motivations isn’t easy, but it the Octalysis Framework offers us exactly the right tools to do exactly that. In the end it is all about the correct balance for between short and long term motivational design and how to make the experience fun and rewarding. Gamification and game techniques will equip us with additional tactical tools. Let’s consider two strategies to first encourage active participation in corporate training, and second to make corporate training ROI positive for your company by employee application to daily work activiites. People like the feeling of making a meaningful choice. People like the feeling of agency. When encouraging training, don’t compel your employees. Instead, make them feel impelled to get the most out of training. As game designer Jesse Schell reminds us, even the illusion of choice is often enough. During Scaffolding (3-6 months on the job), present opportunities for training, explaining to employees that your team (or the company at large) is facing a certain problem, and there is knowledge within this training which could help resolve the epic challenge. Again, we are giving a meaningful choice and a narrative as gamification techniques to intrinsically pull employees into the training. Post-training, we can offer varying projects to allow the employee to demonstrate their new understanding and give further development opportunity. Here, we are introducing an extrinsic motivator into our training activity loop. By removing the competitive aspect from training, employees will feel good about what they’ve learned instead of concerned that they aren’t learning at the same pace as their teammates. Instead of feeling judged, employees will take chances and get out of their comfort zones. New skills will be learned faster. Fresh ideas will blossom. If you’re using a Learning Management System (LMS), managers or trainers can still monitor progress and give encouraging feedback or assistance as a mentor figure. This style of a system allows top performers to do more work in the same way that as a child I earned the right to do more homework by progressing more quickly through the math textbook and tests. Think: how can we reduce competition in learning settings while inspiring collaboration? In the Octalysis framework, competition is Black Hat, while collaboration is White Hat. Over time, people will feel much better about collaboration–this is especially true for training and learning environments too. We’ve covered a short-term approach to getting employees to attend, participate in, enjoy, and benefit from training. But now let’s cover a long-term motivation, growth. Growth is an easy story to tell. The current globalized story is all about growth. By asking an employee how or she intends to grow, most employees–even if they are satisfied with their current role–will likely reply that they’d like to be better at one thing or another. Especially when compared with stagnancy, growth feels like an intrinsically good thing. Now that your employee as made the meaningful choice about growth, it is only left to guide your employees toward training, skill acquisition, skill development, and other pursuits which will help them as an employee and will also help your team or company. You do not necessarily need a robust gamified system to achieve the above outcome. If your management team is equipped with the persuasive tools and conversational abilities, half the battle is already won. Further, by giving your employees ownership over their learning (Core Drive 4: Ownership & Possession) or designing a leveling system (dynamic, but mainly Core Drive 2: Development & Accomplishment and Core Drive 3: Empowerment of Creativity & Feedback) are two ways to emphasize growth. If you’re looking to create a tangible system of training and development, appointment dynamics and leveling systems can be useful. These are advanced considerations. When people see the path they are on, it becomes easier to walk it. This vision is empowering for employees and users. Additionally, by showing people what other employees like them have achieved, you provide social proof toward a development and accomplishment aim. Khan Academy shows learners the possibility space of a learning journey. Degreed Pathways and Team Treehouse curriculums are more clear-cut learning routes to walk. Duolingo, meanwhile, uses Protector Quests (Game Technique #30) to strengthen skills that need revisiting. This particular technique motivates players through Core Drive 4: Ownership & Possession and Core Drive 8: Loss & Avoidance, and pedagogically aligns with the latest behavior and learning theory. In the Octalysis framework designed by Yu-kai Chou, a Level System (Game Technique #85) is a Tier 3 system which dynamically motivates players through accomplishment and creativity. Why creativity? If given an advancement schedule, players will try to figure out creative ways to move ahead through the system. If properly designed, the learning will come in direct correlation with advancement. Often, training is done to please the boss or manager, driven by avoidance behavior. Further, classroom training often does not transfer into daily activities. This is to say the knowledge expected to be acquired by the employee isn’t grasped at the level with which the employee understands and desires to use that new knowledge in their daily activities. Gamification and human-focused design aren’t being applied correctly. If the employee doesn’t apply learning day-to-day, training ROI is negative. In the variety of companies with which The Octalysis Group has consulted on employee engagement to behavior science to training design, it is clear that a close eye on the desired actions and win-states of employees (from the employee perspective) is required before the company thinks about how it will serve its own business metrics. 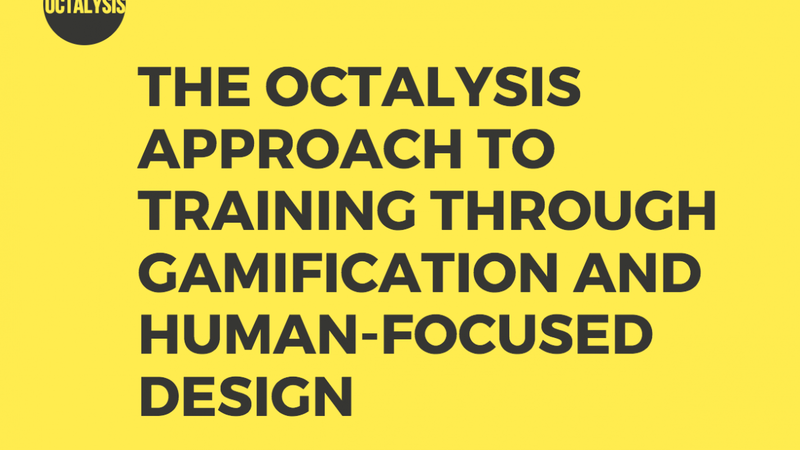 The Octalysis Group runs workshops for companies to walk them through the details of their employee types and the win-states they would like to carry them toward, all using a methodology of workplace gamification. These workshops can stand alone, but often, companies get so much value they decide to work more with us to see what magic we can create together. To learn how we can assist your firm in creating better training for your employees, get in touch with Joris Beerda right now.